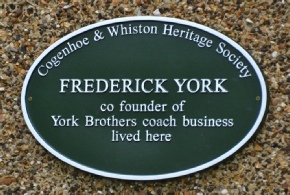 FREDERICK YORK brother of George (see Plaque 11) trained as a blacksmith but joined his brother as the goods and coach business developed in 1926. 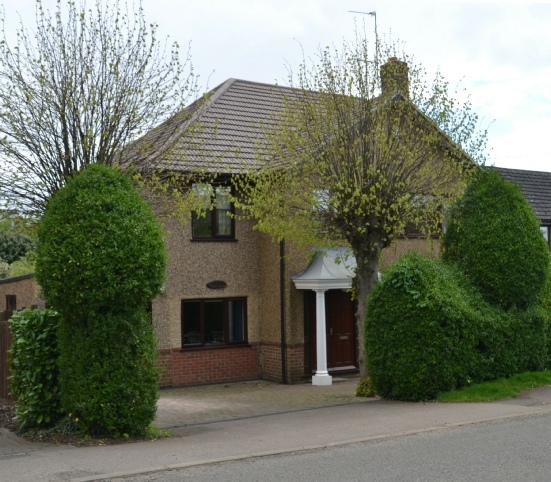 After the Second World War, Fred was running the business, George having stepped down on a daily basis to concentrate on farming at Roe Farm in Cogenhoe and later, Church Farm, Little Houghton. Fred’s sons Alf and Bob were Managing Director and Chief Maintenance Engineer respectively. He had The Limes built and lived there until his death in 1965. 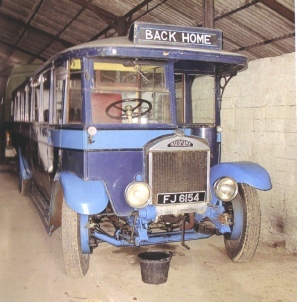 Yorks had a fleet of Maudslay buses and in the 1960s decided to acquire a historic example. FJ6154 was run by Exeter Corporation. 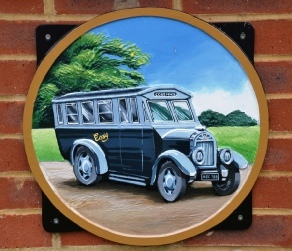 The Easy coaches are commemorated on the Cogenhoe village sign.